Discussion in 'Downhill & Freeride' started by pancho64, Apr 10, 2008.
i hate to be such a newb and post this but picking out my new ride has been such a PITA ive be racking my brain for the past couple weeks testing out bikes and throwing out ideas for new builds. this is where im at so far. - current choices are sxt, demo 7, intense ss, bottlerocket and a sinister r9 maybe built up with a shorter rear shock and a totem. Why the shorter shock on the sinister? because there are a lot of bikes out that would fit your criteria better than those i think. You can change the head angle from 64° to 66° and run short or long chainstays (430mm or 440mm). Out of all your choices I would say the demo 7 would be the best bike in my opinion. I have an SX Trail that is the best bike I have ever owned, but if your going to be DH ing then I'd go for the extra travel and beefed up frame. 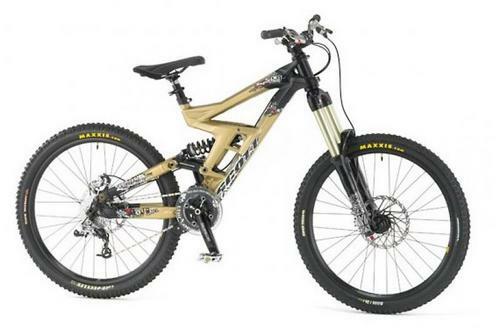 Wondering why you narrowed it down that much on bike choices for mostly riding it DH?? There are a ton of bikes out there that would be more suited to DH then your choices, but the Demo 7 would work nice at Whistler and N*. im definitely open to more suggestions. and i was thinking shorter shock on the sinister because i dont need all that travel. putting a shorter shock on will really mess up the geometry on that bike. especially since a lot of people run upwards of 40% sag on them. similar geo, adjustable travel from 5" to 6.5", lighter, it costs a bit more though. i loved my bottlerocket. if i was in the market for a similar bike (not that i would give up on the Deutschmaschine) the Wildcard would get a solid look-see. CANFIELD JEDI!!!!! Forget your choices and come to the dark side. You may want to look into a Morewood Shova LT with a Totem. Mine has worked out great as a do it all bike. Call Richard at Morewood and see what he would do for you. The Sinister R9 is a great bike, but it is a whole lot of bike too. I know that if I ever opt for a full on DH bike, that is on the top of my list. But like I said, it is a whole lot of bike. When I was looking for a new bike I rode one and loved it, but it was so damn fast that I was convinced I would turn myself into hamburger on it. I hit a 5' drop without even knowing it was there and just kept ripping. See if you can find a used Sinister Splinter MX - there are a bunch of them around (I know a local WA shop has one in almost brand new condition , and I'm sure they could ship it: Drop N Zone) and they are SUPERB bikes - perfect for what you describe. They match nicely with a Totem as well. With your budget, you could come up with a killer ride based on that frame. I am going to be putting a Lyrik on mine, and I use it for everything - Shore, Whistler, whatever. Oh, forgot to mention that the Splinter has fully adjustable geometry, so you can dial it in for whatever terrain you happen to be riding. Travel is adjustable too (5"-6", which is more than enough if you know what you are doing). 2nd this the morewoods have proven themselves several times over. The Orange Patriot 7 looks pretty sick and there's a U.S. website that's going to be carrying Oranges soon. thats really the only thing stopping me from getting an r9 im kinda afraid it is too much bike for my riding. have they been setup with singlecrowns? is it any less pedalable than a demo 7? I have a R9 with a 888 up front, they are alot of bike I have seen two people set them up with totems too. They do pin it quite well but when it comes to jumping mine it by no means jump like my Kona Stinky did. The bike soaks up anything I have every thrown at it. fair enough have you ever had to pedal it for an extended amount of time? I checked their site... no mention of it? i've been looking for one of these frames. Of those bikes an r9 is by far the least pedal-friendly of them, but it is entirely possible. I used to pedal a lot on mine with a 32t ring and 12-32 cassette and it was fine (or as fine as a 9" DH bike can be). 38t and a tight road cassette isn't the best way to get from point a to point b though. Given your criteria (similar to what I do) the r9 could work, and you can find really great deals on used ones that are just as good at new, FTW will help you out if theres a problem. Last I heard, rumor is that Frank may be parting ways with sinister. So I wouldn't exactly rely on that. From what you have said, it sounds like you want more of a full on downhill bike if you're gonna be riding and racing whistler and northstar. Get yourself a light build around 40 lbs and it will be plenty flickable enough. If you're looking for a smaller bike with a singlecrown, i would go with a specialized demo 7 or a morewood shova lt.
Give them a call. They have a pretty much new Splinter MX in red sitting in their display case up front. I think it is on consignment. I spoke to the guy who owned it and he told me he bought it as a second bike, and only rode it twice. Going by the condition of the frame, I wouldn't doubt it. It is a medium. Very sweet bike. I flippin' LOVE mine and won't ever give it up. ALSO: you can absolutely run a SC fork with an R9. The Totem is a popular choice. The R9 is going to be a bear to pedal, but you will smoke everybody coming down. I'd still look for a Splinter. Yea I have a few friends from the Sinister family waiting on some bits and pieces from him too, but he's only doing it as a matter of tying up loose ends so to speak (or so I've heard). Judging by the number of separate sources I've heard this from, it may be a little more than just something from the rumor mill (unfortunately). This isn't to say FTW is getting out of bikes. oh and thanks for the heads up on the splinter. how much are they selling it for? i guess thats all i really care about is coming down. how is it to jump the r9? does that depend a lot on suspension setup? I've only ridden mine so I'm guessing the suspension will make a big difference. Rumor - ftw's filling iron horses void without dw. The R9 is a pure DH animal. It is really designed to stick to the ground, which it does extremely well, but there was some footage of Jamie Ford making a 50+ foot gap (off a teeter!) on his R9. I guess suspension setup has a lot to do with it, but the R9 is also intended to run lots and lots of sag which would make it not so snappy off the lip. You would rule the drops for sure. The R9 is IMO the perfect Whistler bike, but I ride other stuff too, so that's why I like the Splinter so damn much. I don't recall what the Splinter is selling for. Give them a call.